This is for YOU, you know who you are. YOU make us better and WE want to return the favor. Something that many of us will learn the hard way is that we’re not indestructable. We often put everything and everyone ahead of ourselves and our health, when in reality the better condition we are in mentally, physically and personally, the bigger change we can be in the world and to those in it that we love and care about the most. This is coming from someone who struggles with this every day – me. 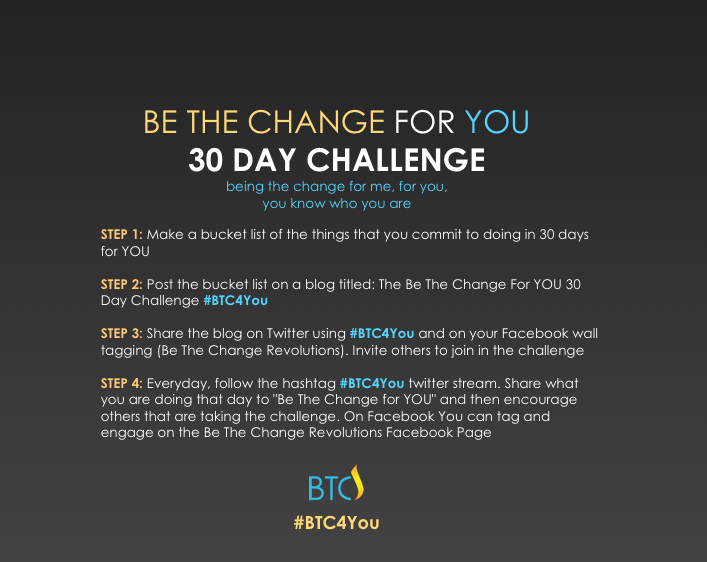 STEP 3: Share the blog on Twitter using #BTC4You and on your Facebook wall tagging (Be The Change Revolutions). Invite others to join in the challenge. I’m being the change for me, for you. I’m hoping you’ll be inspired to do the same. WATCH THIS INSPIRATIONAL VIDEO AND GET STARTED!